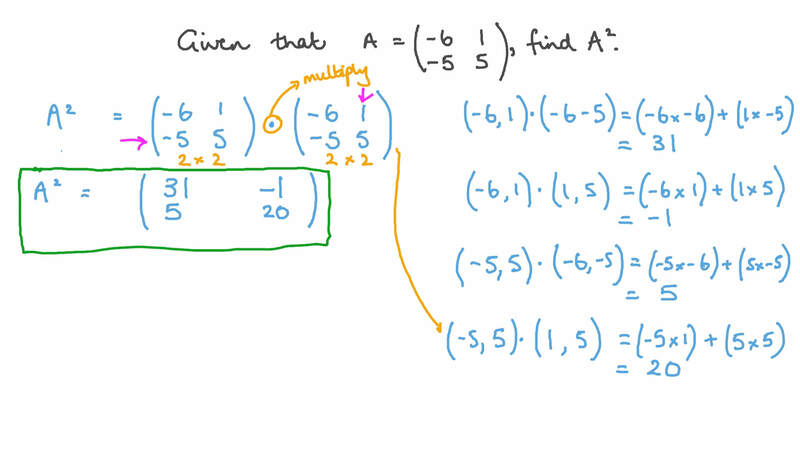 In this lesson, we will learn how to multiply matrices. Given that find ( 𝐴 + 𝐵 ) 𝐴 . Given that find 𝐴 2 . Given that find 𝐴 𝐵 if possible. B It is not possible. Given that 𝐴 =  − 5 − 6 5 0  , find 𝐴 + 5 𝐴 + 3 0 𝐼 2 . Consider the matrices Find 𝐴 𝐵 , if possible. Consider the matrices Find 𝐴 𝐶 𝐵 and 𝐵 𝐴 𝐶 if possible. What can you conclude about it? AFor a given 2 × 3 matrix 𝐴 , there can be a matrix 𝐵 that is not the 2 × 2 identity matrix for which 𝐵 𝐴 = 𝐴 .
BFor a given 2 × 3 matrix 𝐴 , there can be a matrix 𝐵 that is not the 3 × 3 identity matrix for which 𝐴 𝐵 = 𝐴 .
CFor a given 2 × 3 matrix 𝐴 , there cannot be any matrix 𝐵 except the 2 × 2 identity matrix for which 𝐵 𝐴 = 𝐴 . 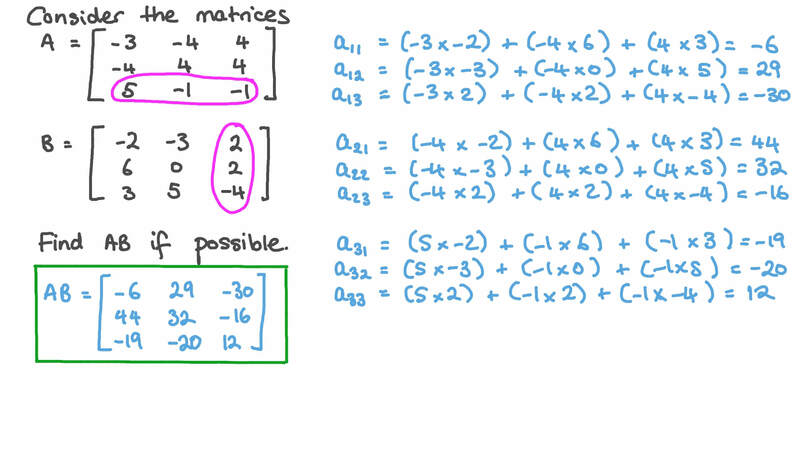 D For a given 2 × 3 matrix 𝐴 , there can be a matrix 𝐵 that is not the 3 × 3 identity matrix for which 𝐴 𝐵 = 𝐵 . 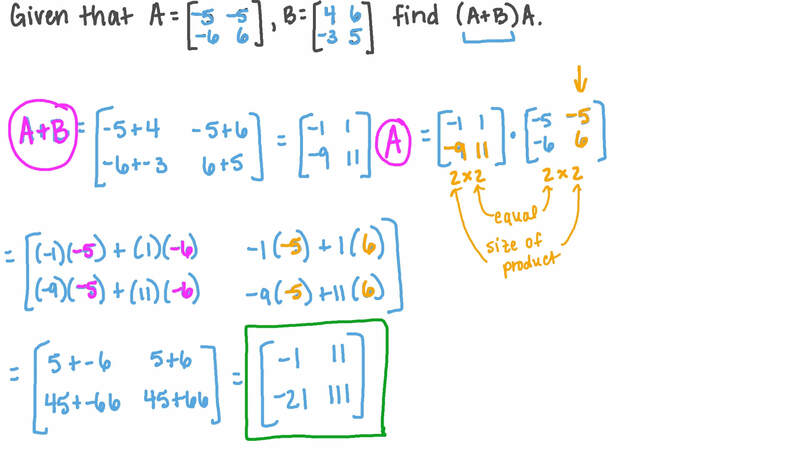 Is it possible to find a matrix 𝐵 with the above property for every 2 × 3 matrix 𝐴 ? Find 𝐴 𝐵 𝑇 and 𝐴 𝐵 𝑇 . Let 𝑥 = ( − 1 − 1 1 ) and 𝑦 = ( 0 1 2 ) . Find 𝑥 𝑦 𝑇 and 𝑥 𝑦 𝑇 . Consider the matrices Find 𝐴 𝐵 𝐶 if possible. Given that and 𝐼 is the unit matrix of the same order, find the matrix 𝑋 for which 𝐴 𝐵 = 𝑋 × 𝐼 . Given that and 𝑖 = − 1 2 , find 𝐴 𝐵 if possible. Given that determine 𝐴 𝐵 if possible. Given that find the value of √ 𝑥 𝑦 . Given that where 𝑂 is the zero matrix of order 2 × 2 , find the values of 𝑥 and 𝑦 .